My husband and I are supposed to be on a diet. A weight diet AND a money diet! For Valentines Day though, I figured we could splurge just a little on calories and sugar, and I could save money by making a little treat from things we already had at home. 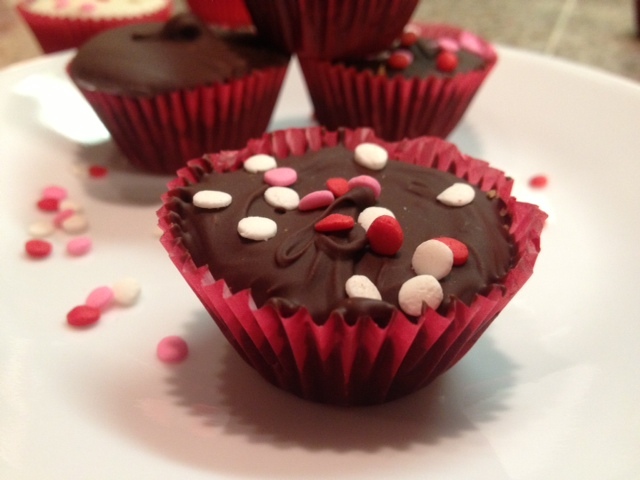 Peanut butter cups are SO easy to make and I always have the ingredients! After trying it out this time it made me wonder why we ever buy Reese cups in the first place! You can even buy Reese peanut butter in the store to make your own cups with...so why not? I lined my mini muffin pan with my mini cupcake liners. At first I wasn't sure if the paper cups would work...but after the white chocolate dried...they were perfect! Melt the white chocolate chips according to the package. Heat until smooth and creamy. Take a spoon and drizzle the chocolate into the liners. 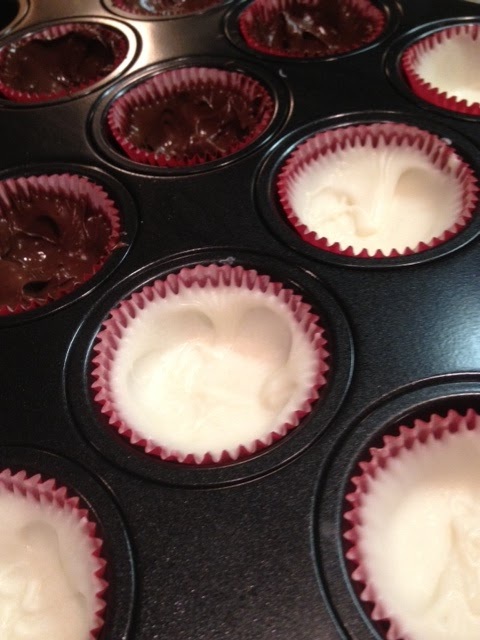 Make sure to push the chocolate onto the sides of the cups as well as the bottom. The chocolate should form a "bowl" in the liners. 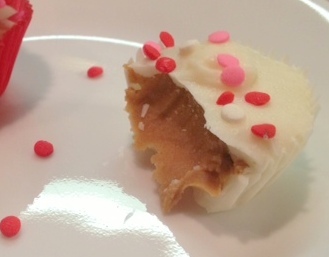 If you are doing white chocolate peanut butter cups, the white chocolate hardens within a few minutes. If you are using regular chocolate it takes a while. 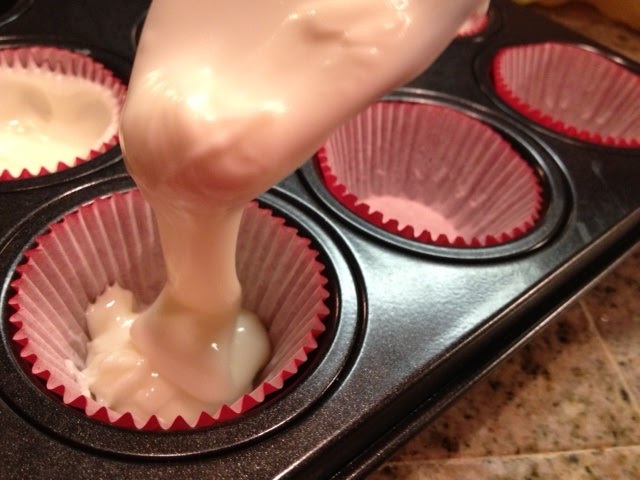 You can speed up the process by placing the muffin pan in the refrigerator for a few minutes. Be careful not to leave them in there too long though because the chocolate will become very very hard. Mix peanut butter with sugar (optional). With two baby spoons I filled the chocolate with peanut butter. Leave rims of chocolate exposed so when you add the other layer of chocolate, it will make a peanut butter cup. 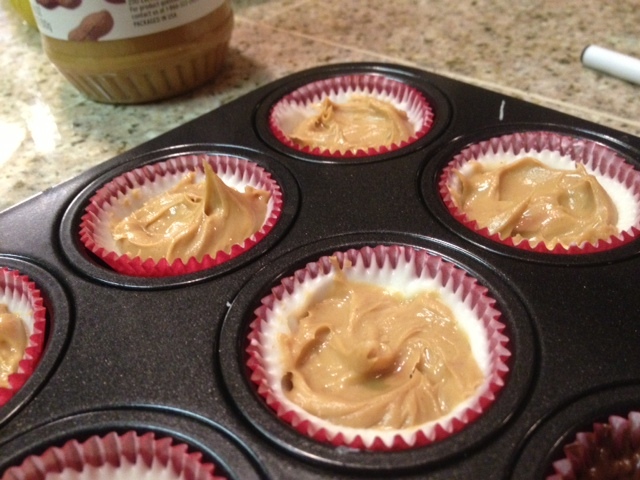 Melt the remaining white chocolate chips and drizzle on top of the peanut butter, covering the whole cup. You can decorate them now like I did if you would like. haha YAY! I love that we both made these!! Aren't these great! 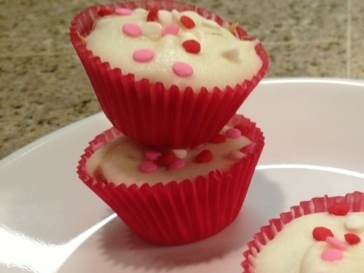 I love how you made them in the mini cupcake pans!